Today’s animation is a miniature representing a drummer from the French 54th Line Regiment from the Napoleonic Wars. 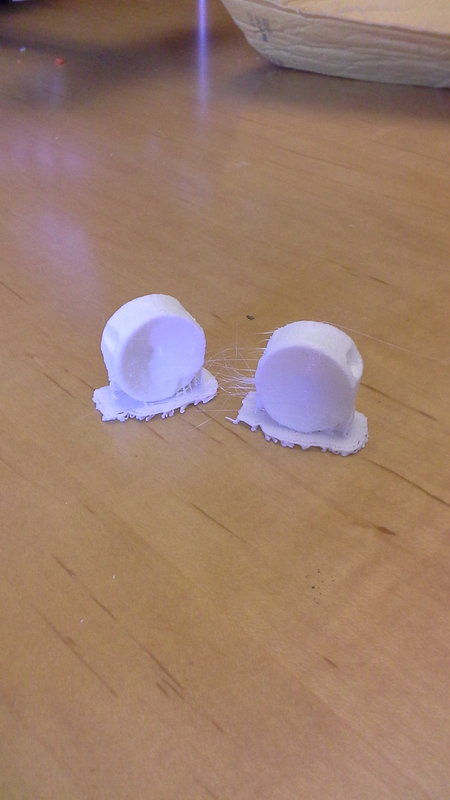 The 3D scanner did not completely record the drumsticks, due to their thinness and cylindrical shape. Virginia Commonwealth University undergraduate student Chelsea Miller brought this figurine to the Virtual Curation Laboratory from the Virginia War Memorial, where she is currently an intern. 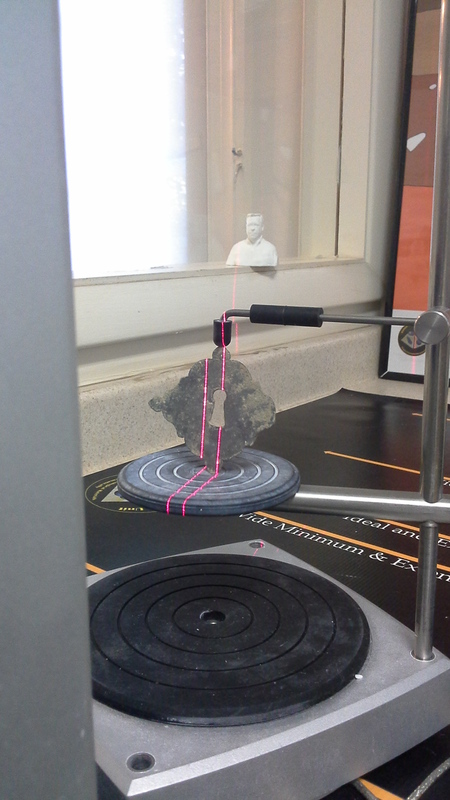 The figurine was scanned as part of an effort to digitally highlight part of the Virginia War Memorial’s collection, which includes an extensive collection of historic-period miniatures. Today’s animation is an 18th century spigot that was scanned at Fairfax County’s Cultural Resource Management and Protection collections repository in the James Lee Community Center, Falls Church, Virginia. According to Chris Sperling of the Colchester Archaeological Research Team (CART), this spigot was found in a cellar feature context from the town of Colchester. Other artifacts indicate that this context is a 3rd – 4th quarter 18th century deposit. The cellar is believed to be associated with the house of Morris Pound, a vintner. George Mason IV issued a recommendation and call for subscribers to support Pound’s winemaking, including helping him purchase a press. One of these subscribers was George Washington. This spigot was scanned on July 27, 2012, as detailed here. 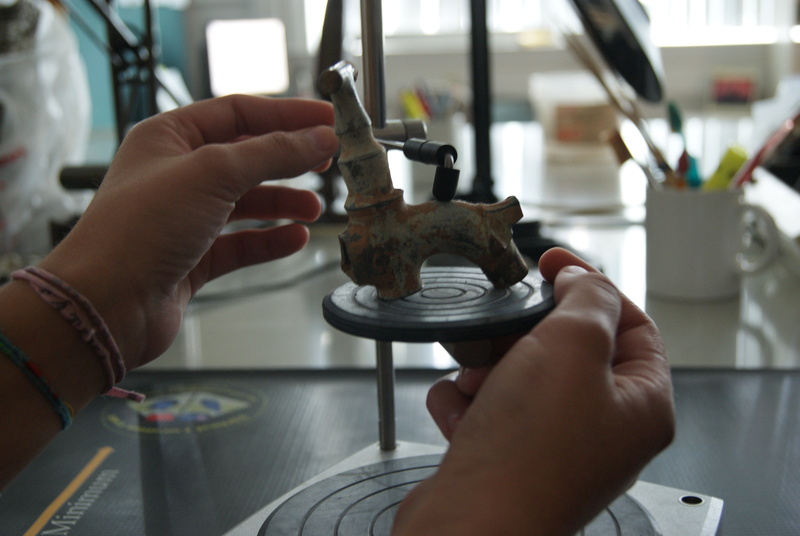 VCU alumnus Mariana Zechini sets up the spigot for scanning. Today’s animation is a World War II-era porcelain Japanese hand grenade that was scanned at the Virginia War Memorial on October 20, 2014. Toward the latter part of World War II, metal became increasingly scarce for the Japanese Empire so manufacturers turned to ceramics to produce hand grenades. Digital Curation Specialist Lauren Volkers created this animation from her edited digital model on October 21, 2014. 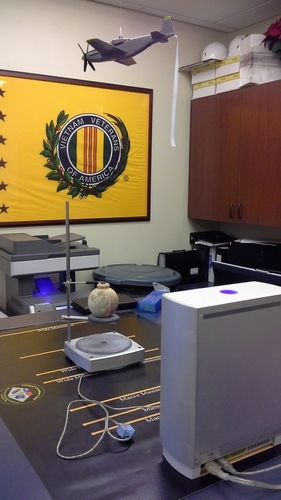 Scanning a porcelain Japanese hand grenade at the Virginia War Memorial. Today’s animation is a miniature representing a soldier from the Grenadier Company of the French 54th Line Regiment from the Napoleonic Wars. Virginia Commonwealth University undergraduate student Chelsea Miller brought this figurine to the Virtual Curation Laboratory from the Virginia War Memorial, where she is currently an intern. The figurine was scanned as part of an effort to digitally highlight part of the Virginia War Memorial’s collection, which includes an extensive collection of historic-period miniatures. 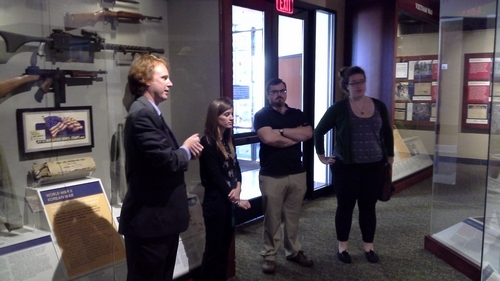 Virginia War Memorial Curator Jesse Smith talks with VCU students Chelsea Miller, John Bush, and Hannah Lickey. John and Hannah are current interns in the Virtual Curation Laboratory.